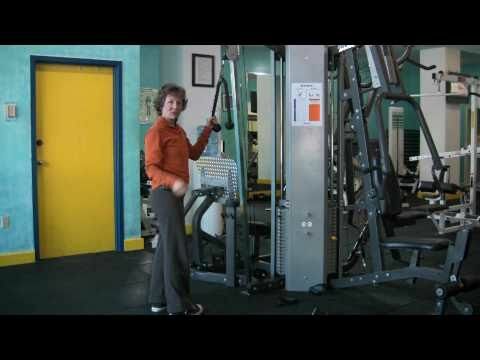 Tricep cable pulldowns are one of a number of excellent weight lifting exercises for osteoporosis. Many people use it as an alternative to the tricep extension exercise on the floor or ball. The following video demonstrates the guidelines for executing tricep cable pulldowns with proper form. This is especially important to people with osteoporosis or who are concerned with their posture. Caution is advised for people with osteoporosis since the additional load and technique can lead to poor alignment, a flexed posture and the increased risk of fracture. Tricep cable pulldowns can be effective but you might need to make a few small modifications to gain the most benefit and reduce your risk of fracture. I encourage you to incorporate tricep cable pulldowns into your weight training osteoporosis program. However, pay attention to how you execute the pulldown (especially your postural alignment) and how you use the tricep pulldown cable machine and you will enjoy many years of safe bone building. To learn more about a comprehensive exercise program for osteoporosis, I encourage you to consider my MelioGuide Exercise for Better Bones program.